Once upon a time, the forest animals decided to start a school because they were concerned about falling behind in the competitive environment. They formed a committee to develop the curriculum and nominated Owl as principal. The committee decided classes should include running, flying, jumping, burrowing, swimming and climbing trees. Duck is about to become a dropout. He is being asked to forego what he is really good at so he can focus on fixing his weaknesses; something he has neither the desire nor ability to do. The moral seems obvious. Yet most companies – indeed, most individuals continue to focus on fixing weaknesses rather than building strengths as the road to success. If you’re not good at cold-calling and networking, go to Sales 101 for improvement. If you’re frequently late for meetings and have a messy desk, go for time management training. That’s not always a bad thing. Maybe the reason you can’t play a violin is that you’ve never held one or learned the basics. You don’t know your intuitive, natural ability until you’ve been exposed to ways in which you can practice and enhance that skill. But some things will always be easier for you to succeed at than others. Why not play to those strengths? Lucky is the person who, like Wayne Gretzky, learns early in life what they are good at and leverages that skill to the heights of greatness. Many people don’t learn their true strengths until they are middle-aged. Some never do. Building strengths while minimizing the impact of weaknesses will accelerate your career. Spending all your time fixing weaknesses is more likely to make you mediocre. If you’re gregarious, become an awesome networker. If you’re more reserved, develop your skills in questioning, listening, building trust and getting the answers you need to solve the customer’s problems. If you’re aggressive and like to win, develop your ability to collect old accounts, or work for a company that rewards extra effort with bonuses or contest prizes. Research from the Gallup Organization shows you’re more likely to succeed when you build on your existing strengths. For more insight, read, Now Discover Your Strengths. 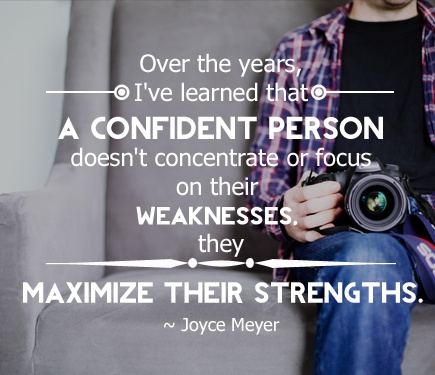 Are you focused on your strengths or weaknesses?